Last post was my first post as a guest blogger here at The Splintered Mind, and I realized I neglected to introduce myself. Anyway, I’m Manuel Vargas, and my day job is philosophizing at the University of San Francisco. I mainly publish papers on issues connected to agency, responsibility, moral psychology, and various topics in Latin American philosophy. In my heart of hearts, though, I am an armchair sociologist of philosophy. Since I can’t blog much about that at my usual place of bloggery (the Garden of Forking Paths), I’m doing it here for the next few weeks. In my previous post I discussed two models of philosophical production, a traditional one emphasizing cautious, precise, and highly elaborated ideas, and a newer (to philosophy) model emphasizing novelty as paramount with a somewhat downgraded (but not rejected) emphasis on caution, precision, and conceptual elaboration. For better or for worse, my bet is we’ll see the second, newer model (and variants that lean in that direction) proliferate over the next couple of decades, making up a larger and larger chunk of how philosophy gets done in the English-speaking world. I can think of several reasons, which I mention in the Underblog. My main interest, though, is to think about the consequences of this trajectory if indeed it is the case that this approach will proliferate. I’m inclined to think that we all benefit from the presence of a mixture of varied strategies in the general philosophical population. However, I wonder whether what we’re likely to see is (1) fragmentation across communities that reflect judgments about these different models, followed by (2) diminished interaction across these communities, followed by (3) greater entrenchment of the newer model across the profession, followed by (4) further fragmentation of subfields developed internal to those fields working on the newer model. As some of the commentators noted on that earlier post, something like this seems to be what happens in the sciences, and one might think it is simply the general trajectory of fields. But there is also a temptation (also expressed in the comments in the earlier post— go read ‘em!) to think that philosophy should be different, more synoptic, more concerned with how everything hangs together. It is harder to see how you do that if the discipline suffers from field fragmentation of the sort I’m gesturing at. At any rate, what, if anything follows from all of this? Should awareness of this trajectory affect how we encourage graduate students to think about their own publication strategies? Does the traditional way of doing things need defense? Is so, how? If not, why not? ... is now up in draft on my homepage. In the 1870s, Francis Galton asked people to describe their visual imagery experiences when recalling their breakfast table as they sat at it in that morning. Apparently ordinary people gave very different reports, spanning the full range from claiming that imagery was entirely unknown to them to saying that their imagery was as clear and detailed, or even more so, than ordinary vision. Since then, a long history of attempts to correlate differences in subjective report of imagery experience with performance on presumably imagery-facilitated tasks (like mental rotation, mental unfolding, visual memory, and visual creativity) has largely failed. Given the ease with which most people can be brought to uncertainty about the character of their imagery experience (its richness of detail, its stability, its coloration, etc. ), and given the history of debates in psychology and philosophy about the phenomenal character of imagery (e.g., the "imageless thought" debate, the Locke-Berkeley debate about abstract ideas), it shouldn't be too surprising that people's reports about their imagery experience don't reliably reflect real differences in their underlying experience. Hence, the disaster of Galton's subjective methodology. As always, comments warmly welcomed (here on this post or by email). The title and framing around Galton are new. (Previously it was "How Well Do You Know Your Own Visual Imagery? ", without section i and with less focus on Galton throughout.) I'm inclined, today at least, to think the shift makes the chapter livelier; but I could easily see changing my mind about that. I take it that for any one reading this blog, it is not news that philosophical publication matters for disciplinary reputation. What I think is less widely recognized is how there are increasingly two main models around which philosophers organize their own writing, and what consequences this might have for individuals and the profession as a whole. The older, traditional model is one that aspires to produce only careful, precisely worked out, and exhaustively defended works. Doing this takes time, and on this model, quantity of production is not nearly so important as quality of production. Indeed, on this model, too much publication suggests a kind of shallowness, or a failure to carefully think things through. In recent years, an alternative model has emerged in various parts of the profession, especially those that interact with the cognitive and social sciences. On this model, it remains a virtuous to produce careful, precise, and exhaustively defended works. But these virtues are not paramount. Instead, what is paramount is the presentation of a promising new idea, a novel argument, or a relevant datum that does not already have currency in the discussion. Philosophers working under the newer model tend to publish more frequently. It is a model where one can justify a publication by presenting the new idea even if the presentation of it is not maximally careful, precise, or exhaustively defended. Moreover, to the extent that one’s interlocutors also operate with this model, one needn’t be especially worried about the old virtues: if the idea is a good one, the marketplace of ideas will do much of the precisifying, along with the articulation of objections and replies. It is a model that relies on something like a division of cognitive labor, where the marketplace of ideas does much of the work that old-model philosophers regard as a prerequisite to publication. Of course, a mangled presentation never benefits any idea, so the old virtues are never completely abandoned even on the new model. They are merely downgraded, and (partly) off-loaded. There are I think, lots of things to say about how this plays out in the life of the profession. It is certainly relevant in hiring, tenure, and promotion, and in how subsets of the philosophical community regard one another. Philosophers working under the older model tend to regard the work of philosophers on the younger model as superficial, ill-conceived, not very philosophically rigorous. Philosophers on the newer model tend to regard philosophers on the older model as (let’s be honest) stuffy, remarkably unproductive (especially if at a Famous Institution), and oftentimes disconnected from the larger field or profession. What I wonder is if, over time, there is any difference in useful philosophical production generated by these models? Take two communities, one working on the old model and one working on the new model. Add a hundred years. I wonder which community will, after a hundred years, have made more philosophical progress by whatever standard you measure such things? Last year, Josh Rust and I looked at the rates at which political scientists vote, compared to other professors. 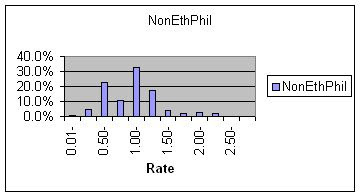 We also looked at the rates at which political philosophers voted, compared to ethicists in general and to philosophers not specializing in ethics or political philosophy. Our main finding (see here) was that all groups voted at about the same rate, except for political scientists, who voted about 10-15% more often. This fits with our general finding (so far) that by a variety of measures ethicists don't behave much differently than other people of similar social background. The result that surprised me most from that study, though, and the one I keep coming back to in my mind, was this: The variance in voting rate was the the same (really, virtually exactly the same) for all the groups. I had expected that extreme views about voting -- either about its pointlessness or its importance -- would be overrepresented among political scientists and political philosophers, and that this would be reflected in the voting patterns. 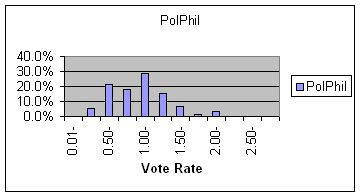 Maybe political philosophers aren't any more likely to vote, on average, I thought -- but there'd be a fair number who were highly conscientious, voting in virtually every election, and a fair number who were principled non-voters. If this were the case, they should show a wider spread of voting rates -- or in other words a higher variance. However, we found no such thing. The zeros are a little harder to interpret: For about 25% of sampled professors no voting record was found -- which might reflect a pattern of not voting among those professors, but might also reflect registration under a different name or in a different area. So the following numbers certainly overestimate the number of non-voters. 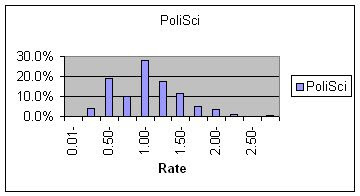 But notice again that there is no tendency for overrepresentation at this end of the scale either, among political scientists or political philosophers (the variations in the percentages here are all within the range of chance variation). What is the difference between those philosophers who are willing and those who are unwilling to invest the time to master works like Hegel's Phenomenology of Spirit, Kant's first Critique, or Heidegger's Being and Time (assuming those works touch one's areas of interest)? It must have something to do with trust -- trust that these men were geniuses enough to make the effort worthwhile. Perhaps most relevant here is a ratio, the ratio of self-trust (that one can make progress without their help) vs. trust in others. Of course, pleasure along the way is relevant too: how much joy one gets from puzzling out the details, in the early stages of understanding. But it's hard to imagine such pleasure without an undergirding trust. 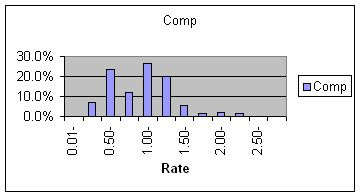 It seems to me there's a great divide within philosophy between those with high self- to other-trust ratios and those with low ratios. So I wonder: Is there any way to measure this difference, apart from examining a philosopher's willingness to bang her head against Kant's deductions? Does the difference correlate with any other philosophical or non-philosophical traits or behavior? What Is an Illusion, Exactly? I'm confused again. Publicly expressing confusion seems to have become a (perhaps tiresome) professional habit of mine these days. So is the skilled oarsman experiencing a visual illusion as he looks at the oar? If we say no, then I'm worried we're off onto a slippery slope to entirely denying the possibility of illusions that are known to be such. When I press gently on the side of one eye, I seem to see double. Is this also no illusion, since I know that's how things are supposed to look when I press on one eye? 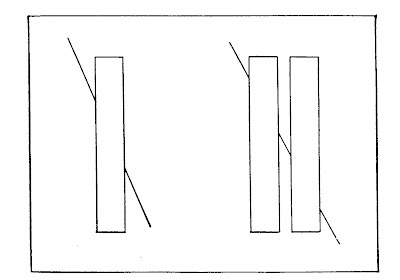 When I look at the Poggendorff illusion (below) I know that if the upper segment of the line going behind the rectangle really is aligned with the lower segment emerging near the bottom, they should look (in some sense of "look") offset. I've seen this illusion so much that now I think that if I saw a figure of this sort where the lines didn't look (in the relevant sense) offset I would probably infer that they really were offset. Parallel to the oar case, perhaps, what it is for the line segments to look aligned (for me) is for them to look (in a different sense) like they don't align. But if the Poggendorff illusion is no illusion for me, then is any illusion an illusion to someone who knows how the illusion works? So maybe we should say the oarsman does experience illusion. But then there's the risk of a slippery slope on the other side, toward saying that much more is illusory than we ordinarily think. If the bent oar is illusory, it seems that looking at things through a curved glass of water must be, since the refraction similarly distorts things. And then it seems like a magnifying glass held at arm's length similarly creates illusion. But then also does a magnifying glass held near the eye? A telescope? Ordinary corrective lenses? I've posted a draft of Chapter Two of my book in progress (tentatively titled Perplexities of Consciousness). The chapter is titled "Do Things Look Flat?" and is a revision of my 2006 essay of the same title, with a little more nuance and historical depth and a longer discussion of the view (dating back to Ptolemy but peaking, evidently, circa 1900) that most things appear doubled in the visual field. Comments/suggestions/criticisms welcome, of course, either as email or as comments on this post. Does a penny viewed at an angle in some sense look elliptical, as though projected on a two-dimensional surface? Many philosophers have said such things, from Malebranche (1674/1997) and Hume (1739/1978), through early sense-data theorists, to Tye (2000) and Noë (2004). I confess that it doesn’t seem this way to me, though I’m somewhat baffled by the phenomenology and pessimistic about our ability to resolve the dispute. I raise a geometrical objection to the view and conjecture that, maybe, the view draws some of its appeal from the over-analogizing of visual experience to painting or photography. Theorists writing in contexts where vision is analogized to less projective media – signet ring impressions in wax in ancient Greece, stereoscopy in introspective psychology circa 1900 – seem substantially less likely to attribute such projective distortions to visual appearances. Stereoscope enthusiasts do, however, seem readier than scholars in other eras to attribute a pervasive doubling to visual experience – like the doubling, perhaps, of an unfused image in a stereoscope.